Feminine picot edging and a cheeky contrast turned hem (at top and bottom) adorn this soft warm cowl, which has been designed to match the Manning Park Hat, the Manning Park Mittens, and the Manning Park Socks. 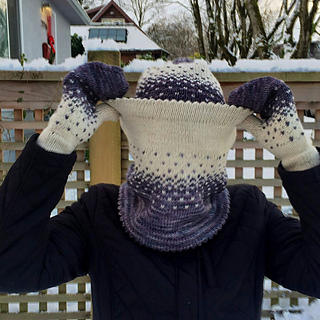 The cowl gently tapers from bottom to top and the easy-to-memorize colourwork pattern adds a bit of fun. Malabrigo Rios: worsted weight, 100% superwash merino wool; (100g); 210 yards (192 metres). Approx 75 g of MC (plomo) and 75 g of CC (natural). 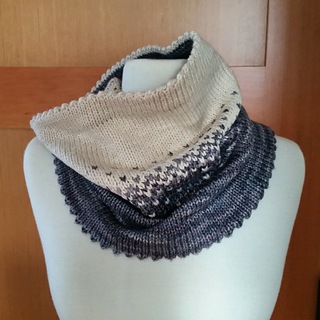 This pattern is suitable for an intermediate knitter who is familiar with picot cast-on; picot bind-off (or sewing a turned hem); as well as K2tog and YOs. 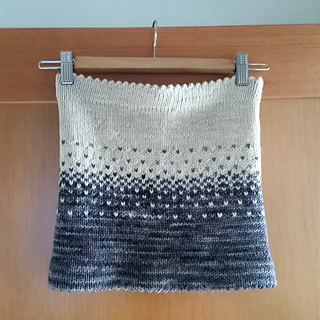 You should also be familiar with stranded colourwork, although the colourwork pattern is not too complicated. Follow these links to video tutorials on: provisional cast-on; joining a provisional CO with live stitches for a turned picot hem; or, if you prefer, a bottom-up picot edge / knitted hem from a CO edge. 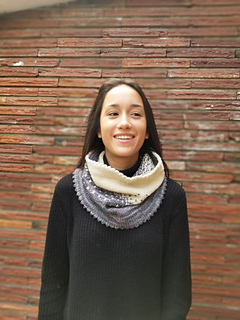 This cowl is knit from the bottom-up, in-the-round with a turned picot hem at top and bottom. 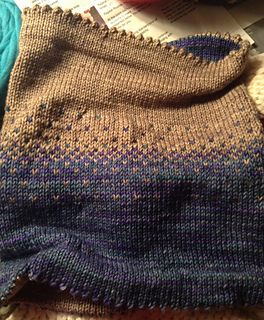 Stranded colourwork pattern is charted. You can easily add (or subtract) width by adding (or subtracting) 4 stitches. Length can also be increased by adding an equal number of rows to both the MC and CC sections; additional yardage will be required. 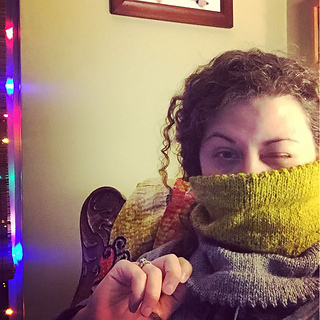 Many thanks to katerinal1, eveariel, atreehuggerswife, d3z, and tyjochay, who speedily test-knit my pattern, and kindly (and graciously) alerted me to a few errors, some large, some small.